Despite my high hopes, nothing really extraordinary happened during our little Memorial Day weekend road trip. No ghastly injuries. No demonic possessions. Darn. Around noon on Saturday, we arrived in the tiny hamlet of Chagrin Falls, Ohio, which was quite lively due to its annual Blossom Time Festival. After perusing some of the stores and checking out the waterfall, we stopped at the Popcorn Shop Factory for some much-needed sustenance: ice cream for the kids and iced coffee for Dad. I wanted to continue strolling around town, but the kids fell victim to the Siren call of the local carnival. So off we went to pay way too much to ride a bunch of rickety deathtraps and win some worthless tchotchkes. 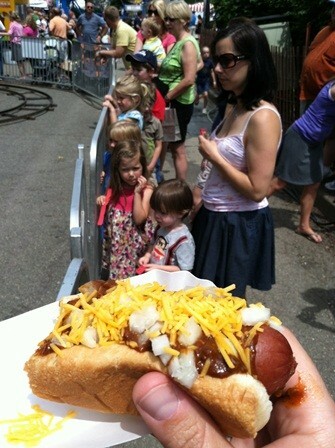 As the kiddos stood in line to risk their lives, I got lost in a Coney Island dog. Next, the girls went off to have a special mother-and-daughter pedicure at the salon, while The Animal and I enjoyed some good ol’ father-and-son time at Chuck’s Fine Wines. At the salon, Boogieface freaked out because the only person who could do the Hello Kitty design on her toenails was – GASP! – a guy. Outrageous! Luckily Mommy was able to talk her down, and they both came out with a fabulous new look. Minutes later, Boogs stepped on Mommy’s foot, ruining the $25 dollar paint job. Back at Chuck’s, The Animal helped me pick out a nice bottle of wine for the evening. “How ’bout da one with da woof?” he suggested, pointing to a bottle with a wolf on the label. It also had a $69.95 price tag on it. Instead, I selected the $12.95 bottle—my favorite vintage. Next we dined at a much-too-high-end-for-people-with-young-kids type restaurant. Since it was relatively empty at the time, we decided to risk it all for some good sushi. I ordered a Smutty Nose Old Dog Brown Ale, which was apropos, since I had been battling seasonal allergies all day. Meanwhile my daughter played drums with her chopsticks as my son smashed his diecast cars together again and again. Of course neither of them would eat anything off of the menu. Yet somehow we managed to spend $75 smackers. Back outside, we stumbled upon a whole line of vendors selling an array of festival foods at much more reasonable prices. Sure, a corn dog isn’t seared ahi, but it isn’t $5 a bite either. Their stomachs empty from their sushi boycott, the kids devoured a mountainous helping of flavored ice. Next we high-tailed it over to the local high school to wait over an hour to watch a hot-air balloon launch that, much to our “Chagrin” (sorry) never happened, due to the blustery 3-mph winds. Back at the hotel, the kids fell asleep in minutes, worn out from a long day of spending our money. I too was exhausted, but I dug deep and mustered the strength to drink a few glasses of Horse Haven Hills Cab, while the soothing sounds of classic-rock rattled the hotel windows from a bar across the street. I woke up early Sunday morning with Boogieface and vegged on the couch as she watched something hideous on Nickelodeon. Then, after blowing my nose seventeen times, me and my sand-filled eyes went downstairs and brought back some quasi-Cheerios type cereal for the kids, which, of course, they immediately rejected. Minutes later, Cassie went down and returned with some sausage, fruit, and waffles for the kids and one of those What-the-heck-were-you-thinking? looks for me. 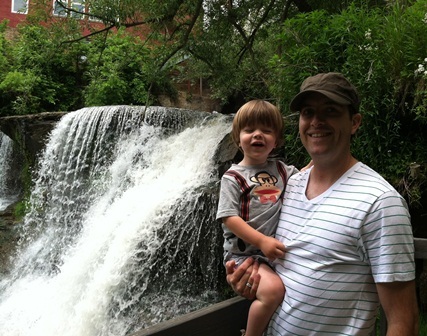 After splashing around in the hotel’s petri-dish of a swimming pool, we headed off one of those “fun” places that offer tons of ways for you to flush your hard-earned cash down the drain. It cost $22.50 just for the four of us to roller skate. Two minutes in, Isaac abruptly quit, wanting instead to go play on the Big Climbing Contraption Thingamabob, a.k.a., the Germ Factory. All the fun and microbes you can enjoy for a mere $6 bucks! On the way home, we stopped for lunch at a much more kid-appropriate establishment in Hudson. Of course, the little buggers still wouldn’t eat. But I was quite pleased with my Dark Horse Lager and meatloaf sliders. If you couldn’t tell, the theme for the weekend was “Healthy Eating”. Finally, Memorial Day arrived. 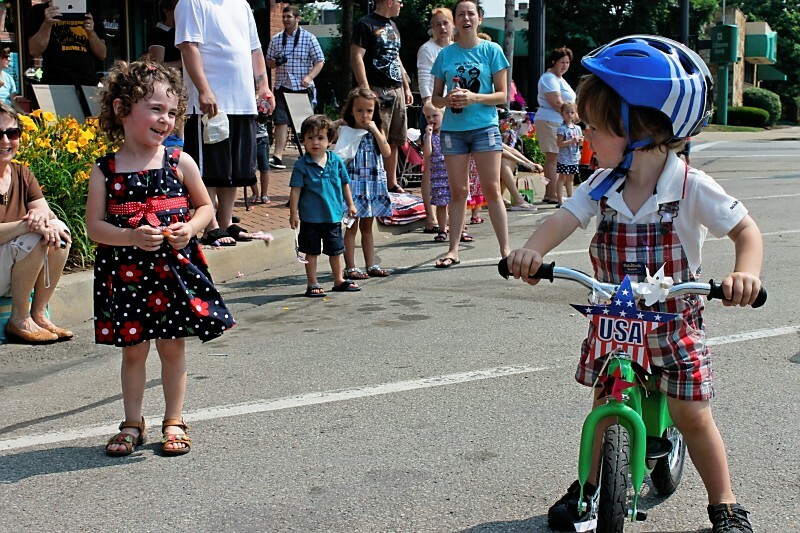 All week long Boogs had been so excited to decorate her bike and ride it in the annual parade up in town. However, on the way to the parade, just half way up the block, she said she didn’t want to ride in it after all. Then she flat refused to even push her bike and began crying hysterically. She ended up watching the parade from inside Cafe Kolache, mostly because she was terrified of the fire trucks’ sirens, which they didn’t even end up using. The Animal, on the other hand, wowed the crowd as he cruised around on his new balance bike, flirting with girls like a lone wolf on a Harley. So despite the crazy allergies, the unforeseen expenses, the minor mishaps and breakdowns, and the new bevy of microorganisms we now host in our bowels, I guess it was a pretty memorable weekend after all. And we have a big, pink, $5 dollar plastic dolphin – a.k.a., Squeaky Pinkish – to remind us of it.